Samsung Champ Neo DUOS Manual | The Samsung Champ Neo DUOS manual or samsung GT-C3262 User Guide is now available to download directly at samsung.com. The user manual comes in PDF format and support in english language. Many information / instructions in this manual for example about phone layout with menu and key functions, tutorial Install the SIM cards and battery, Insert a memory card, access the menu, manage SIM card, make calls, Change your ringtone, using widgets, using the camera, and more. The Samsung Champ Neo DUOS manual very important for owner of this phone, so you must read this guide before using all applications or other. 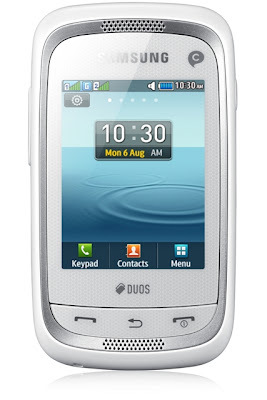 The Samsung Champ Neo DUOS manual / Samsung GT-C3262 User Guide consisting of 4 pages with file size of 1.57 MB. As brief information, the Samsung Champ Neo DUOS is Dual SIM phone with display screen is 2.4 Inch. The phone measuring 96.9x54.3x13.5 mm and available 20 MB In built Storage and powerd by 1000 MAh Battery capacity. The phone work on under GSM network with frequency of 850/900/1800/1900 MHz.